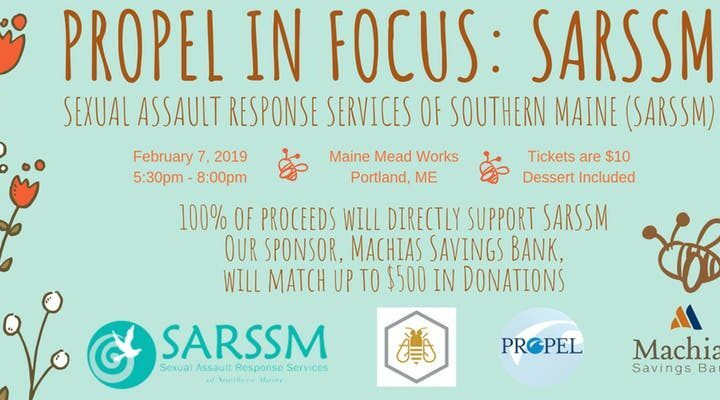 PORTLAND — PROPEL and Sexual Assault Response Services of Southern Maine (SARSSM) will hold its In Focus Event Series from 5:30-8 p.m. Thursday, Feb. 7 at Maine Mead Works , 51 Washington Avenue. It provides a means for young professionals to learn about nonprofits and to identify opportunities to volunteer, donate their professional services, and serve on the boards of the organizations they learn about. The first 25 people to buy tickets will receive a FREE drink ticket for the event. $10 admission. Includes Honey Maker mead and free chocolate treats. The chocolate treats will be a taste of what’s to come at SARSSM’s annual Chocolate Lovers’ Fling on Thursday, Apr. 25. All event proceeds, including ticket sales, raffles, and donations will be given in full to SARSSM. Machias Savings Bank, the sponsor for the In Focus series, has generously agreed to match up to $500 of proceeds from the event in support of SARSSM.